A shared dedication to the continued understanding, exploration, and love of music is what inspired the formation of Beo String Quartet (Sandro Leal-Santiesteban, Jason Neukom, Sean Neukom, Ryan Ash). Equally comfortable performing masterpieces of the string quartet repertoire, spending time in the studio, and working with living composers, the four individuals have introduced many audiences to music of both past and present and of varied genres. 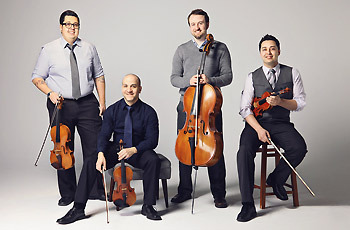 The members of Beo String Quartet hold degrees from some of the country’s top conservatories including the Eastman School of Music, Cincinnati Conservatory of Music, the Cleveland Institute of Music, Carnegie Mellon University, and the Chicago College of Performing Arts at Roosevelt University. They have collectively studied chamber music with the Ying Quartet, the Pacifica Quartet, the Cavani Quartet, the Miami String Quartet, the Cuarteto Latinoamericano, and members of the Cleveland, Guarneri, and Borodin String Quartets. Beo believes that its most important role is to champion music of our time and to create a mutually inspirational relationship between living composers, modern audiences, and performers alike. Recent projects include the premiere of Gilda Lyons' eco-opera, A New Kind of Fallout, with Opera Theater of Pittsburgh SummerFest, in addition to the premieres of over thirty other new works by composers from all over the world. Upcoming projects include Beo String Quartet’s debut recording on the innovative pop-art album, Dead Reckoning, and a string quartet composition competition in conjunction with the Charlotte New Music Festival for 2016. Highlights for 2016 include a state-wide tour of North Dakota, including performances and chamber music seminars with high school and middle school students in eight public schools. In May, Beo will be returning to the Charlotte New Music Festival to work with living composers on writing for the string quartet.